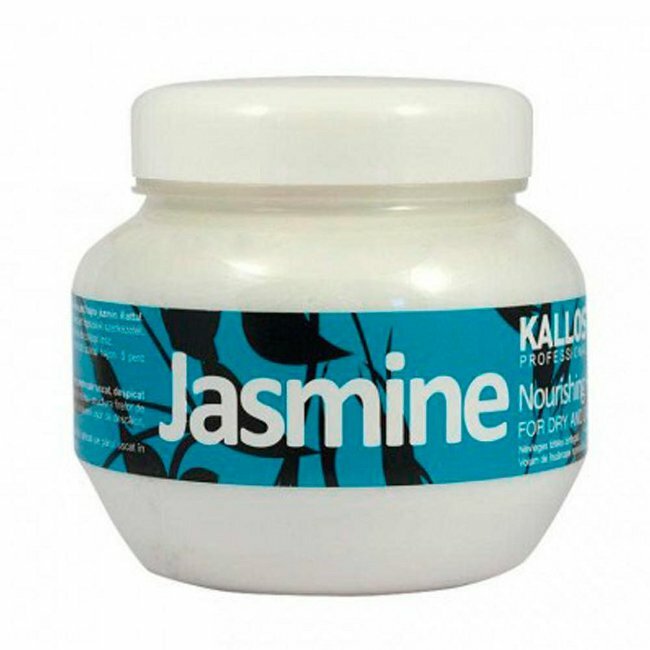 Jasmine Nourishing Hair Mask for Damaged Hair (275 ml) is produced by the Hungarian beauty brand Kallos Cosmetics. The product is designed to take gentle yet effective care of damaged hair. It deeply moisturises and nourishes dry and damaged hair, makes it shiny, silky and manageable. This Kallos hair mask is formulated with natural active ingredients such as jasmine flower extract and hydrolysed milk protein. They provide your hair with vitamins and other nutrients, restoring its natural beauty and health. Besides, jasmine extract gives the mask a light, pleasant scent that transforms routine hair care into a real spa treatment. The product is made in Hungary. It is compliant with strict European quality standards. Free of parabens and synthetic dyes. Directions. Apply onto washed and towel-dried hair. Leave for 5-10 minutes. Rinse with clean water. Ingredients. Aqua, Cetearyl Alcohol, Cetrimonium Chloride, Propylene Glycol, Hydrogenated Polyisobutene, Parfum, Cyclopentasiloxane, Dimethiconol, Panthenol, Jasminum Officinale Flower Extract, Citric Acid, Hydrolyzed Milk Protein, Benzyl Alcohol, Methylchloroisothiazolinone, Methylisothiazolinone. Want to buy Jasmine Nourishing Hair Mask for Damaged Hair? Call us or submit your order via our web site! Kallos Cosmetics is a well-known Hungarian beauty brand. It specialises in the production of professional cosmetics for body, hair and skin care. Since the company's inception in 1978, its products have become popular in many countries such as Austria, Bulgaria, Croatia, the Czech Republic, Estonia, Finland, Germany, Greece, Latvia, Lithuania, Poland, Romania, Serbia, Slovakia, Sweden and Ukraine. The owners of Kallos Cosmetics claim that only continuous improvement, thorough research and development of innovative formulas, high-quality natural raw materials and strict control at all stages of production can ensure really high quality of finished products while maintaining competitive prices. All Kallos products are formulated with carefully selected natural ingredients, manufactured at high-tech production facilities and tested in accordance with strict European quality standards. Kallos Cosmetics takes pride in its wide range of body, hair and skin care products which include, but are not limited to, body lotions, shower gels, shampoos, hair conditioners, hair masks, hair treatment and styling products, professional products for hair colouring and perm, face cleansers, face masks, face serums, eye creams. The company also produces a series of make up products and nail care products.